Plato's Theory of Forms is rightly considered one of the great philosophical theories of all time. Within a single theory, Plato managed to answer, or at least consider, diverse questions in ontology, metaphysics, epistemology and ethics. The idea of the Forms are referenced or alluded to in much of Plato's initial work but eventually becomes the centerpiece of his philosophy from the Republic onwards. Though there are numerous articles online that explain the Forms, I could not find anything that was simple enough to be understood without knowing philosophical jargon. In this article, I will try to touch upon the broad highlights of this theory without resorting to any complicated jargon. Irrespective of its applicability to modern life, the Theory of Forms represents a fascinating step forward for human thought and deserves to be known and appreciated by all. Let's consider a Table. Particularly this table. 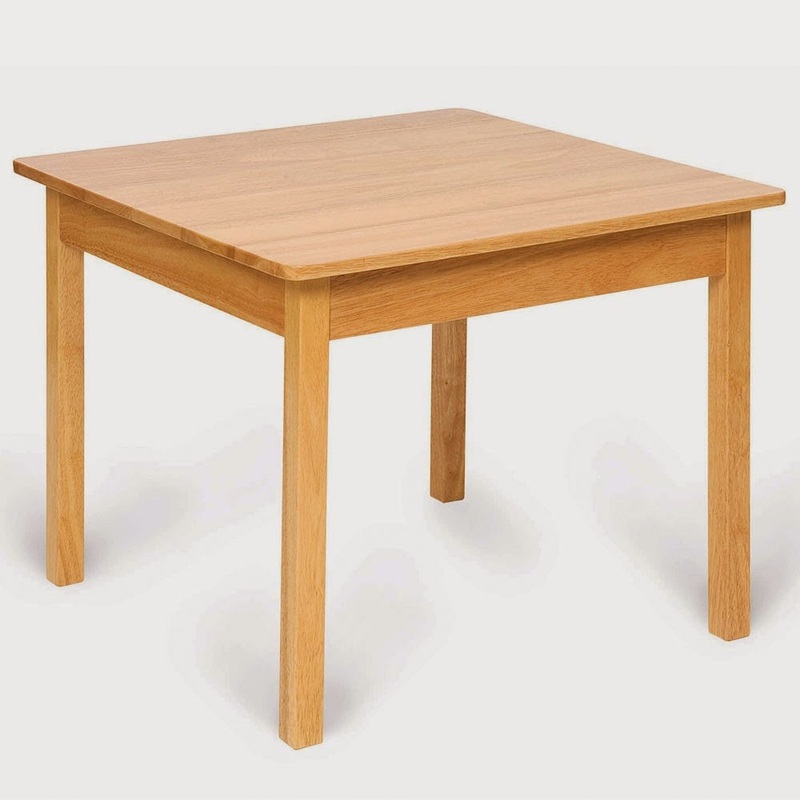 What makes this object a table? Put differently, on account of what virtue is this 4-legged wooden object a table? Obviously, this is not the only table in the world. Tables comes in all sizes, shapes, colors and materials. Given so many tables in the world, what is common to all these objects that makes them all tables? One might say that a table serves a certain purpose - to eat meals. All these objects serve that purpose and hence are tables. This is a perfectly reasonable line of thinking. Alluding to particular purposes for explaining the world is called a teleological definition. However, while this definition can be easily given for everyday objects like tables and chairs, it is not easily given for concepts like justice and piety. What makes all just things just? What makes all pious things pious? Providing teleological definitions for such questions is very hard. According to Plato, the thing that is common to all tables is called the Form of the Table or the Table Itself. In fact, he argues that all tables in the world (called particulars) are tables solely by virtue of partaking in the Form of the Table. The term partaking has a slightly different meaning in Platonic works. I like to think of it as 'deriving from'. All 4-legged wooden objects become tables because they derive the essence of being a table from the Form of the Table. While different particular tables can have different attributes (a red table, a round table etc. ), they are all tables nonetheless because of partaking in the same Form. Hence, according to Plato, all of reality (the world that we perceive) is constituted of particulars that are derived from the Forms. Suppose a carpenter wants to make a table. To make a table, he must have a mental image of the table which he will use as a reference to build one. According to Plato, this mental image is nothing but an image of the Form of the Table. This raises some interesting questions. Suppose all the particular tables in the world are destroyed by some means. Does this mean that the Form of the Table is also destroyed? Clearly not. Carpenters the world over have mental images of the table and can easily make new ones. So then, does the Form exist solely in the minds of human beings? Considering that diverse philosophical schools consider reality itself to be a figment of human imagination, this is a loaded question. Plato, however, believes in a less fantastic idea. He considers the Forms to be a mind-independent reality of the world. Let's see why. Suppose along with all tables, we also eradicate all the carpenters in the world. Clearly, the world will be Table-less for some time, but without doubt, eventually carpentry will rise again and tables will be made. This suggests that the Form of the Table is something outside the minds of carpenters, but it gets imprinted in their minds. A second argument would be that one person's mental image of a table can be slightly different from another's mental image of a table. In fact, it is impossible for two persons to have an exactly identical mental image of anything. But, it is still possible for the two persons to have a meaningful discussion about tables. Hence, despite the apparent differences in their mental images, there is something common to their mental images that makes discussions about tables meaningful to them. This also suggests to the existence of a Form outside our minds. Lastly, it is possible for a person's image of a table to change over time. It is certainly true that particular tables deteriorate and change over time. However, the Form of the Table, the essence of table-ness, does not change through time. This makes Forms eternal and by virtue of which, superior to every particular table in the world. When considering the superiority of the Forms, I find it useful to think about circles we draw in math class. No circle drawn by hand or by tools is perfectly circular. There will always be some deficiencies associated with it. However, it is possible for us to even look at a badly drawn circle and reason about the perfect Circle Itself. We are able to deduce knowledge about the perfect Circle from inferior representations of it. Hence, to summarize, for every particular there exists a Form by virtue of which, the particular is what it is. This Form is separate from the particular as well as outside the minds of perceivers. This Form is eternal and superior to every particular of it. Even though the above discussion has primarily looked at Forms as the basis of reality (falls under metaphysics), Plato envisions a much wider role for them. He considers the Forms to be the basis of knowledge as well. Plato has a very rigorous notion of knowledge. According to him, knowledge has to be infallible and can only be about 'what is'. In which case, knowledge cannot be about particulars like this table or that chair. Because, these particulars keep changing and will eventually perish. So whatever knowledge we have about them will go meaningless once they perish. Hence, Platonic Knowledge can only be about things that are not formed or perished -- ergo, the Forms. In fact, Plato's metaphysical existence of the Forms follows from his exacting standards for Knowledge (his epistemological views). Obviously, I have barely scratched the surface of the Theory of Forms. Plato's develops his theory in great detail and even constructs an educational journey for one to gain proficiency with the Forms. If interested, I will suggest reading the Republic, considered by many to be Plato's seminal work. While a lot of troubling questions have been raised about the Forms (including by Plato himself in a later work), I still believe that the Forms are a singularly cool idea. 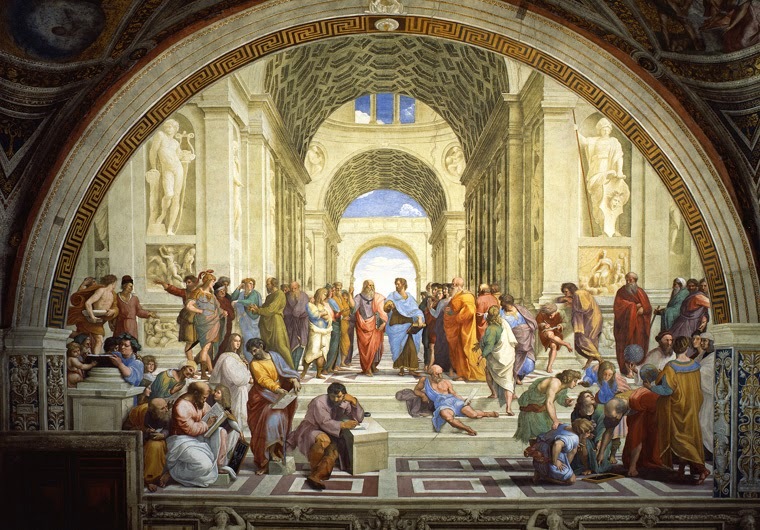 PS: The first picture is Raphael's famous fresco - the School of Athens. Plato is the figure in the center pointing to the sky, a reference to his Theory of Forms.